Did you ever play with Rainbow Brite when you were younger? I did. She was cool. All my friends and I loved Rainbow Brite. And now she's back with her friends for the next generations. Thanks to MomSelect and Hallmark for sending me a Rainbow Brite package-interactive cd's which include Rainbow Brite animated short, Games & puzzles, Rainbow Brite's theme song, and much, much more. The Rainbow Brite Adventure Pack cd was handed out to my girls and they were just so thrilled. 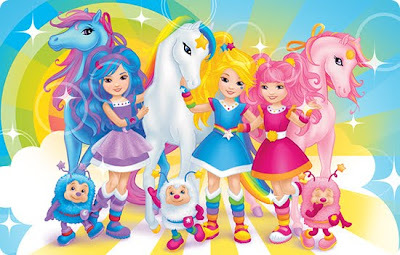 Visit Rainbow Brite online at www.rainbowbrite.com to view 4 new Rainbow Brite animated mini episodes. 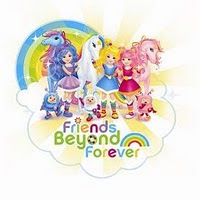 When you are there you can join Rainbow Brite, Moonglow, Tickled Pink, Starlite, Shimmer, and Sunriser on their adventures through Rainbow Land. By the way, moms, Rainbow Brite dolls are now available at Target and Toy R Us. Check online www.rainbowbrite.com for availability. No compensation was received for this post. These are my opinions only. Thank you to MomSelect and Hallmark for sending cds for me to pass along to all my girlies. They loved them!! Thanks again!